February 22, 2017|Posted in: Happy, Healthy, Smart Kids!, Healthy, Beautiful You! Every now and then I come accross articles that are titled something like, “Why I’m Not My Kid’s Friend.” That’s definately not the case in my experiences as a child or as a parent. Those articles make me feel sad for the parent who wrote them and for the children that they parent. My very first friend in life was my mom and my dad was the second friend I ever made. 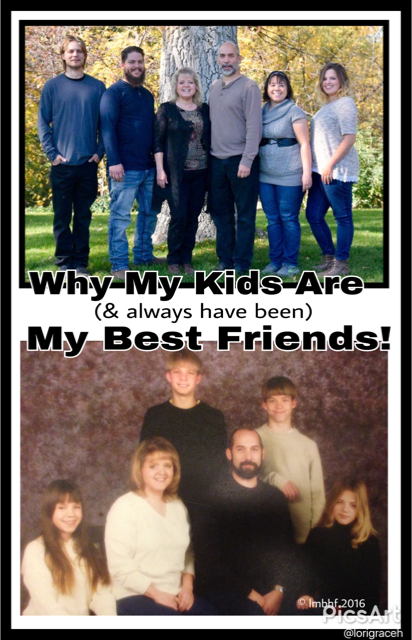 My four kids include two biological daughters and two sons that we adopted when they were 13 and 14 years old. They are all grown up now but right from the start my kids have always been my friends. It was so much fun when they were little and now as adults it’s very gratifying to have them as friends. I keep my friend’s secrets and overlook their bad behavior. My friends and I engage in bad behavior together. I share my concerns and my burdens with my friends. 1. A Good Friend Expects and Brings Out The Best In You. Some people keep secrets for their friends or look the other way when they do things that they shouldn’t. Certainly a good parent doesn’t do those things when it comes to their children. But are those really things we should do with someone we consider a friend? Of course not! If we care about someone, we want what’s best for them. That means we expect their best and we’d never just accept behavior that’s hurtful to them or someone else. Being a good person means doing the things that you know you should and that you know are right. As parents we’re responsible to teach our kids to do right and to sometimes give consequences when they don’t. Typically, we don’t think that applies to our friends, but is that areally true? When we choose the standards for our lives we do look at and consider the examples of our peers. Hopefully we learn from good examples and do our best to be good examples ourselves. But we certainly never punish our friends or impose consequences . . . or do we?? Sometimes we have to step back from a friend (for their sake, as well as our own) until they change undesireable and destructive behavior. 2. A Good Friend Usually Puts Your Needs Before Theirs. Most parents don’t have much trouble putting their children’s needs before their own. We think of that as typical parenting behavior. A good friend will focus more on the wants and needs of the other person than their own, much like a parent does with their kids. A healthy friendship where both friends are focused on the other, rather than themselves, has very little conflict. A selfish relationship where one of the friends cares only about themselves, isn’t really a friendship at all. Similarly, we do need to remember that as parents, we’re responsible for teaching our kids to have empathy for others. We need to teach them to care about the wants and needs of other people, such as their friends, and yes even (or especially) their parents. Sometimes what a friend or a child needs is their own space, identity and independence. We wouldn’t be a good friend if we monopolized all of the other person’s time. Certainly, parents of grown children need to respect their independence and allow them to live their own lives. Parents of young children must teach and foster in them a healthy sense of independence. In order to give of ourselves to others (wether that be our friends, our children or our parents) we have to have a solid sense of our own identity. We don’t need to (nor should we) say everything we think! It isn’t appropriate (or kind) to burden anyone with every single thing you ever think or feel. We all have doubts and fears and irrational thoughts from time to time. Sometimes our thoughts or feelings are such that, even we ourselves, shouldn’t waste time on them, but rather we should push them quickly away and focus on more positive things. Sometimes though, it is appropriate to share our thoughts and feelings with others and even look to them for support. We all have some friends with whom we share more than others. Some friends just “get us” or are strong enough to handle the tough stuff! The point is, we decide whom to share what with (or we should), based upon the individual, what is appropriate, and what they can handle. Just because some (or most) friends are not someone with whom you would share absolutely anything with, doesn’t make them less of a friend. It’s inappropriate for parents to burden their child with all of their problems. It’s, also inappropriate for parents to deceive kids into thinking that they have no problems. We know that children will grow up to be adults that sometimes have problems, doubts, fears and irrational thoughts. The experience of seeing parents go through and resolve those things, gives kids knowledge to know how to handle them in their own lives. So, just like our friends, we need to be mindful of what is and isn’t appropriate to share with our children. It’s important for our kids to see us as real people (with insecurities and weaknesses) with real lives (with challenges and problems). They can learn from our example how to manage and overcome adversity. 4. A Good Friend Shares Your Heart and Supports Your Dreams. We typically choose friends that are kindred spirits; they share our basic outlook on life and have similar interests. We most enjoy our friends with whom we have the most things in common. Obviously, our children share our lives and have genetic similarities to us and therefore are also a kind of kindred spirit. Who better to share your heart and your dreams with than the children who you are charged to teach and to help to grow and find their way in life. 5. A Good Friend Is Someone with Whom You Share Laughs and Fun Times! I’ve had some fun times with friends, but the best times of my life have been those spent with family; times spent with my parents and with my children! My childhood and my childrens’ childhoods (and now my grandchildren’s childhoods) were/are filled with fun times, happy moments and lots of laughs. As a family, we’ve always shared special occassions, holidays, activities, sporting events, and vacations. We’ve also shared, boring and uneventful days, hard times and sad days and they were all better because we were together and because we’re friends. Among the very best friends of my life are my parents, my children, and my grandchildren, I wouldn’t have it any other way! It’s nice to see a family that gets along that way. I only have one daughter and she and I are pretty close as well. Thanks for sharing. Thank you Clearissa! Daughters are the best!! Awe, such a sweet post 🙂 Thanks Lori from Grammy Dee, #WednesdayAIM #LinkUp #BlogParty, social media shared. I have to agree with you. There’s no one I would rather spend my time with, share my secrets with and watch laugh and learn than my kids – step, and full biological included. I hope they feel the same way for me. But if they don’t, like a good friend, I’ll always be here for them. Thanks for sharing with the Homestead Blog Hop! I agree 100% Lauren. Kid’s are the best!